I just jumped right into Bonnies mystery quilt this year, starting with the (almost) 300 half square triangles. I managed to get them all finished fairly quickly and then stayed caught up with the gold 4- patch blocks. I think this project was exactly what I needed. I love the way it is coming together. I managed to finish 6 blocks. That really isn't very many when you need 44 more. This is where I really slowed down. The headless geese really got bogged down as I searched my fabric stash for variety to make the "sets" of those poor birds. I still haven't caught up, but I'm so proud to have completed 12 blocks. I am bound and determined to have this quilted by the end of February. Perhaps it will do as well for me in the fair this summer as Easy Street did for me last year. My new goal is to learn how to send pictures to my blog from my phone. I am so very computer challenged. Tomorrow I'll take a photo of my 12 blocks and add it to this post so that I can include it for the last post! This might be my first post, but it is a last post to link up for quite a while I have heard. 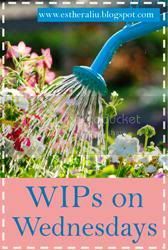 Check what others are working on at Podunk Pretties by clicking here! I need to try this salsa recipe. http://dinnerforacrowd.blogspot.com/2009/08/mom-thorpes-amazing-bottled-salsa.html Unfortunately I'll need to wait about 9-10 months and probably forget I posted it. The link led me to "Dinner For A Crowd". She made it sound so good that I can't wait to try it! I wanted to post these links to a couple of really cute crocheted hat patterns so that I didn't lose them. You might want to check them out if you enjoy crocheting. I have a group of friends that love to make greeting cards. Although I had no extra time to start a new hobby I found myself drawn into this fun group of ladies and even making some cards. We usually meet once a week, but it is a really relaxing environment where you don't feel pressured to work on anything. We laugh a lot. It's just a really great girls day! Since I have had health problems I was shocked to find that I hadn't posted anything for almost 4 months. I had a lot of pictures of various projects and I thought maybe I would do a few quick posts just to delete the photos. This quilt top was pieced from block-of-the-month kits. I only had 8 of the center blocks and 10 of the outer blocks to work with. After moving them to several different arrangements I was finally happy with this one! 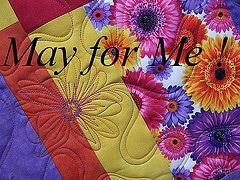 When we complete a quilt, it is donated to a deserving cause. Keepsake Quilting Fabric for life! Keepsake Quilting and Quilters Club of America are offering a great opportunity to win some nice prizes! Go here to enter! I finally finished the piecing of the Crown Royal quilt and got it on the frame. With customer quilts waiting, I didn't want to spend too much time trying to decide what to quilt. My dilemma was keeping the quilting pattern fairly open. This quilt is totally flannel fabric and I wanted to keep a soft feel to it. Sometimes it is a challenge for me to keep my quilting open. I get used to intense quilting on some of the customer quilts, but who wants a stiff flannel quilt? When I think flannel, I think soft and fluffy! Another open space to decide on. I finally chose to go with more feathers and swirls to repeat the design in the borders. I ditched all around the center and the outer borders. I wasn't too thrilled with the way it was looking as I progressed across the quilt. Once it was all quilted and off the frame I decided it looked alright. This took 3 days to quilt because I still have swelling and a dull ache in my ankle when I stand on it for long periods of time. Soft tissue damage can certainly take a long time to heal. I left these little corner squares for last and finally decided once again to repeat those swirls and feathers. All I had to do was to chalk out a circle and put a swirl in the center, then follow the circle around with feathers. The top and bottom borders have a very simple pattern forming an X. My helper was napping. I didn't want to wake him and so it's not a very good picture of the whole quilt. I like the back as well as the front. Now I just need to get my binding on and it is FINISHED! That is one of my favorite words. I told myself (and Anita) that I was going to try to finish a UFO every month this year. I still have good intentions of completing that goal and this will be the project for January. That means I have 9 days to get a binding on this quilt and finish one more before March arrives. I linked this post to Judy Laquidara's design wall, Link a Finish Friday, Off the wall Friday, and also linked to Freemotion by the River's Linky Tuesday. Be sure to go see the beautiful projects that others are working on! 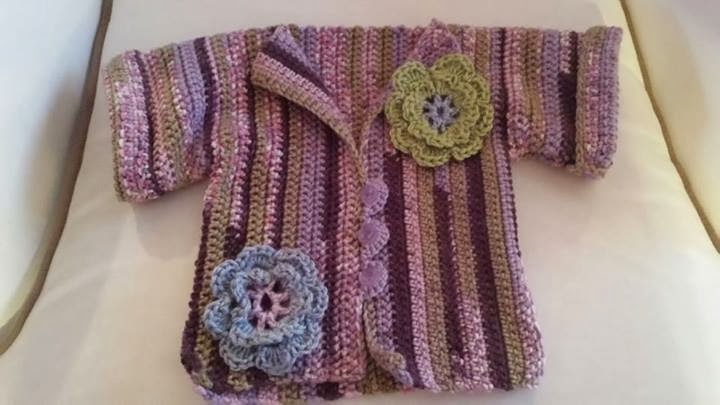 I found this picture of a cute little crocheted jacket on facebook this morning and had to share it so that I wouldn't lose it. I would love to make this in the future. Most of the babies in my life are boys, so I will be making it in hopes of a little girl in the future. Isn't it adorable? This is the link to the actual pattern. My crocheted fabric selvage round rug! This is the round rug that I made entirely of fabric selvage strips. It was crocheted over several years. A little at a time I would add to my large ball of selvage strips that I had saved from various quilts. When I felt I had a sufficient amount to make several rounds I would crochet until I had used it all up. Then I would begin a new ball of strips. I decided it was large enough when It measured 65" across, which is perfect for my porch. I only use it during the "nice" weather and then bring it in, wash it, and put it away till the next spring. Most of the selvages were cut from quilt backs so that I could get 70" or more without any joins. It makes a charming addition to the porch and lies right in front of my white rocking chair. Check out so darn crafty and freemotion by the river for more projects! I got this shawl off the needles last week, but I decided that I will make at least one round of crochet across the top edge to strengthen it. If I was a little more experienced, I would have done something different along that edge from the beginning. Since this is my first attempt at a knit shawl I learned a few things. A friend gave me this pattern. I later saw her shawl that she had made with her homespun yarn and it was beautiful. Some day I hope to remake this pattern with a different edge and with a yarn that I have spun and dyed myself! 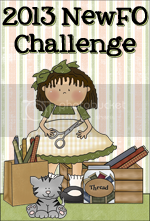 Check out what others are working on at Judy's Patchwork Times. My socks are almost off the needle. I just need to do the kitchener stitch to finish the toe. I love making these socks. They work up quickly on a size 3 or 4 needle. Most of my posts are about quilts or knit/crochet projects. I occasionally post something about my chickens. This is about my chickens. Those who are not interested in chicken related stuff will probably want to quit reading at this point. So a couple of days ago I gave them some yogurt. They loved it and I thought all that white on their beaks made them look like little clowns. I told the hubster about it when I came back inside and he said "It's nice that they can give you so much entertainment". They really are amusing. I think he thinks I am amusing. The temperatures dropped to 10 degrees last night. It never really got above the freezing mark here today. I am always looking for something to take to the girls besides their scratch and layers feed. Now that the winter is here it's not as easy. Tonight I found this recipe. Tomorrow I will make it for the girls. It is supposed to keep them busy because they totally love pecking at something. Maybe it will keep the boss-hen from being quite so cranky with the others. We will see. My design wall is covered with these large triangular blocks. The block of the month is being sponsored by The Gathering Place of Rupert Idaho. We have done 18 and still have 6 more to go. The fabrics are provided in a kit each month and are all by Kaffe Fassett. The patterns come from a book by Jaybird Quilts called Toes in the Sand. I love the ruler they designed that works so well with these patterns. It's been fun doing these blocks because of the fabrics that I never would have chosen plus I'm not that much into triangular blocks! I guess it's pushing me a little outside of my comfort zone. There are a few other BOM's on the far side of the wall, but I have been more focused on trying to keep up with the triangles. 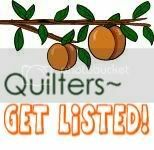 If you want to find out what others are working on be sure to stop by What a Hoot Quilts BOM's Away or Pretty Bobbins to check it out. This is also on the wall. The squares are 1" finished except for the yellow centers in the flowers which are 1/2" finished. It is a 12 1/2" unfinished block. 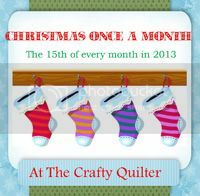 Check out what others are working on at Judy's Patchwork Times. My brother has a friend that likes Crown Royal!!! So he sent me a LOT of these bags for me to make a quilt for him. My first task was to remove the stitches on the top of the bags to open them up and remove the draw string and then I cut as close as possible to the edge of the golden thread serged edges of the front and back of the bag. This left me with an equal amount of front, back, and side strip fabric to work with. I put a blue strip of painters tape on my ruler so that I could position the writing in the same spot on each rectangle I cut. This was much faster than measuring it out every time. So far I am only working with the medium size bags since that is what I have the most of. I cut my rectangles 8" X 4.5" and occasionally I had to remove the stitching off the bottom corner edges to reduce the bulk. I was able to cut most of the strips at 2.25". I tried to cut so that I got the largest piece that I could. In this picture you can see some of the bottom corners look a tiny bit rounded. That is where I removed a little bit of serged edge. My strip sets were pieced with the 3 center strips cut at 2.25" wide. The top and the bottom gold strips were cut 2". My seams were sewn at just a little over a quarter inch. It was around 3/8ths to make the strip sets come out 8". I then cut the strip sets at 8" X 4.5" to match the solid rectangles. I will probably use the back pieces (with no writing on them) to piece a border, but I haven't gotten that far yet. I still have the black bags that I can use somewhere. This has been kind of a figure-it-out-as-you-go kind of project. My brother never looks at my blog, so I am safe to post all of this and it will still be a surprise to him. Hopefully I will have this top finished next week so that I won't be overwhelmed during the quickly approaching holidays!!! I have linked this post to Freemotion by the River for linky Tuesday. Check out what others are working on! I'm almost finished with my version of Multnomah by Kate Flagg. It is a shawl designed with a feather and fan pattern. It is my 2nd attempt at a lace pattern, and I found it not too difficult as long as I have plenty of stitch markers! I only have one more repeat and I will be done, so I will probably do another post with the completed shawl next week. My friend Anita brought me this beautiful yarn from Debbie McComber's A Good Yarn shop in Washington. It is a superwash sport yarn made by Cascade yarns. The color is 0563-112 teals. The next pictures will probably look a lot better. I just realized I took a picture of the back. OOPS! I finally got my February Lady Sweater blocked and found some buttons I like. Check out Judy's blog to see what others are working on. These are the blocks for my Back to Square One October clue. The top is now too large to fit on the wall, so I managed to get a pretty good shot of it before the sun went down! It feels good to be caught up till the December post. Check out Judy's blog to see other's progress! Only the simple borders to add, but because I fell while taking laundry downstairs I can't walk on the right foot for a little while. This happened on Wednesday and has totally messed up my plans for the Thanksgiving holiday. I still have lots to be thankful for, but not for this injury! This is becoming a new favorite mystery quilt for me. I have always loved mystery quilts and the surprise of seeing it all come together. These are the blocks that we made last month. I hope we won't need to use the marbled tan fabric much more or I may run out and there is no way I would ever find more since it came from my stash and I don't even remember where I found it. You should go to Judy's blog to see what others "Back to Square One" quilt tops are looking like! This is the table runner that Loreta made for Begonias custom built dining table. It is 108" by 30"! OOPS! I MADE A MISTAKE ON THE SIZE. IT IS 208" x 30"! I could barely fit it in the picture! The fabrics are all beautiful Batiks. It was quilted very simply with a meander stitch. Another amazing quilt by Evelyn! This little miniature was made by Cynthia. The center has wool applique and is surrounded with a border made from 1/2 inch squares! I couldn't get a good picture of the center quilting, but it has a circular design. I love the way the appliqued leaf branches circle around the star. The back of Linda's jelly roll quilt with a free-motion swirl pattern.